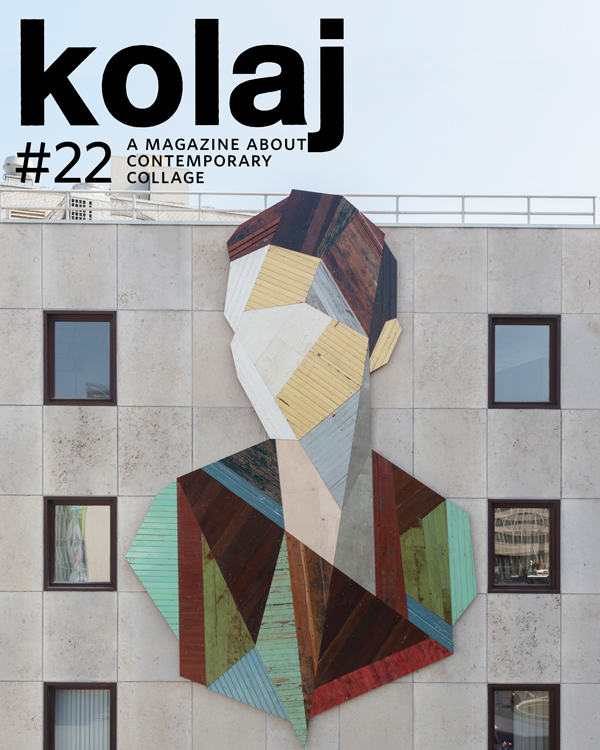 Kolaj #22 delivers a look at the wonderful world of contemporary collage: the people who make it and the people who love it. 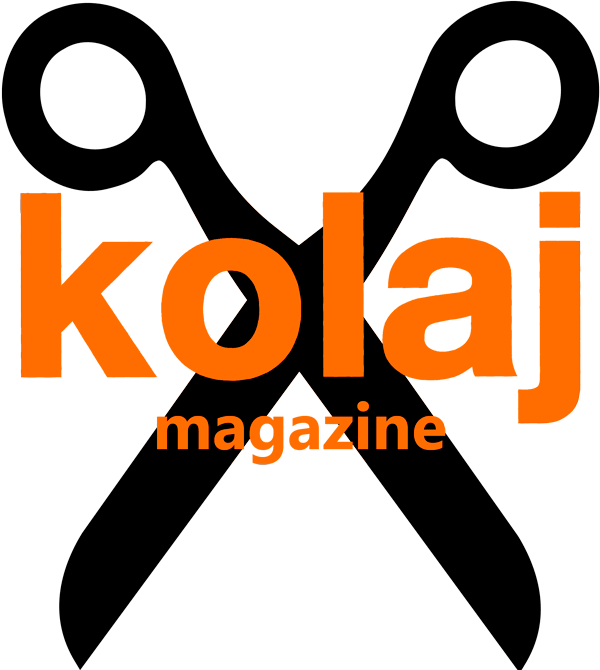 In his editorial, Ric Kasini Kadour says, To heal the world, It’s time to get together. John Stezaker exhibits for the first time in New Zealand. A group show at the Indianapolis Art Center in Indiana hits the mark. The prolific French artist, Guillaume Chiron, has a new exhibition and book. And the Crocker Art Museum in Sacramento, California shows off a number of African American collagists in an exhibition of recently collected art. 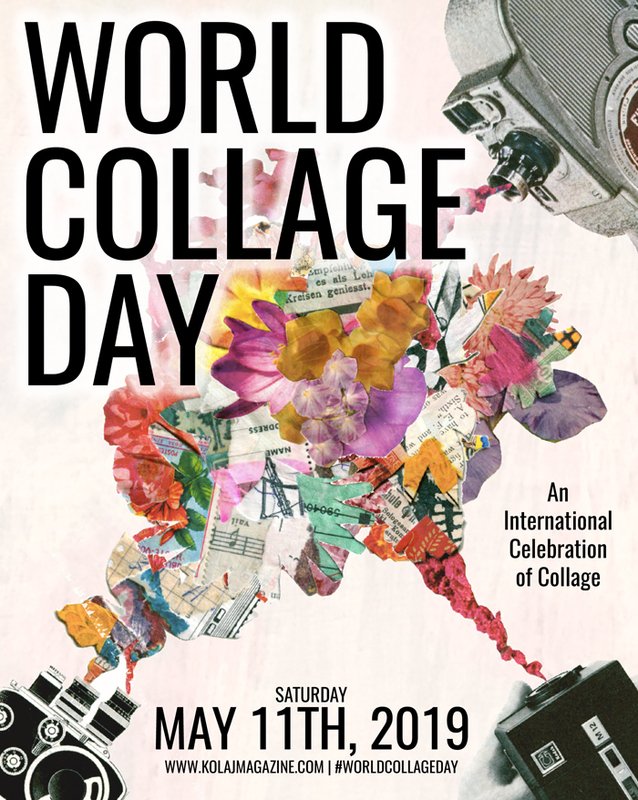 We report on two events: World Collage Day, a celebration of collage takes place on 12 May 2018. 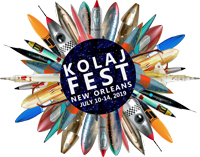 Kolaj Fest New Orleans, a multi-day festival and symposium about contemporary collage and its role in art, culture, and society takes place July 12-15, 2018. Some collage artists use scissors and glue, Steve Hunt uses….a blender? We have an article on this Manchester, United Kingdom artist’s pulp collages. Kevin Sampsell explores the mysterious vintage of Evan Clayton Horback. Sofia Misenheimer profiles Parisian artist Lilyluciole who uses collage portraiture to piece together “unseen” identities. We review Artists Who Make Books from Phaidon. 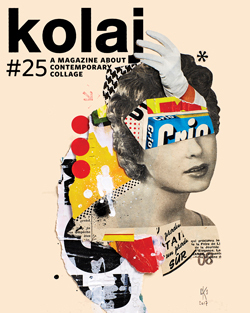 Katharine Coldiron reviews a book of literary collage by Jez Burrows. And we check out runway fashion where we find Comme des Garçons Homme Plus showcasing Cecil Touchon‘s collage. We forgo our usual Artist Portfolio section to bring you “Selections from the Flying Glue Book”, a special feature that reports on a global collage collaboration and features work by Aaron Beebe, Ted Tollefson, Deborah Stevenson , Alice Arango, Alison Kurke, Carol White, Axelle Kieffer, Zach Collins, Zarka, Geronimo Finn, Holger Becker, Tony Melser, Kathrin Göpfert, Flore Kunst, Karyn Huberman Rodríguez, Lucinda Abra, Sabine Remy, Alice Lam, Susanna Lakner, and Aleksandra Perzynska. Already subscribed? Don’t worry, you will be receiving your copy by 10 April 2018.